The US Air Force is moving ahead with its plan to develop a new long-range bomber aircraft to be operational by the mid of next decade. The program is not yet launched, but within this year it is expected that we will see the launch of a request for proposals (RFP). The Air Force intends to begin fielding the bomber in the mid 2020s, with penetrating capability in mind. The service will procure 80 to 100 planes, which will mostly be made with existing technologies. Those machines will also have both standoff and direct-attack munitions and room for a large payload. The service also is exploring the idea of the aircraft being optionally manned. Service officials have cited a cost of $550 million per plane as the ceiling for the program, but even that figure has some mystery to it. Observers have noted that the figure does not include research and development (R&D) costs, which could drive that amount up. For those not acquainted with him, Norman Augustine served in many positions both in the Administration (Under Secretary of the Army) and in the Aerospace & Defense industry (CEO of Lockheed Martin). Lately he lead the Committee that was reviewing the US Human Space Flight Plans. He wrote a fantastic book, “Augustine’s Laws”, about the aerospace and defense industry, the problems that plague their programs, etc. I reviewed that book in this post. 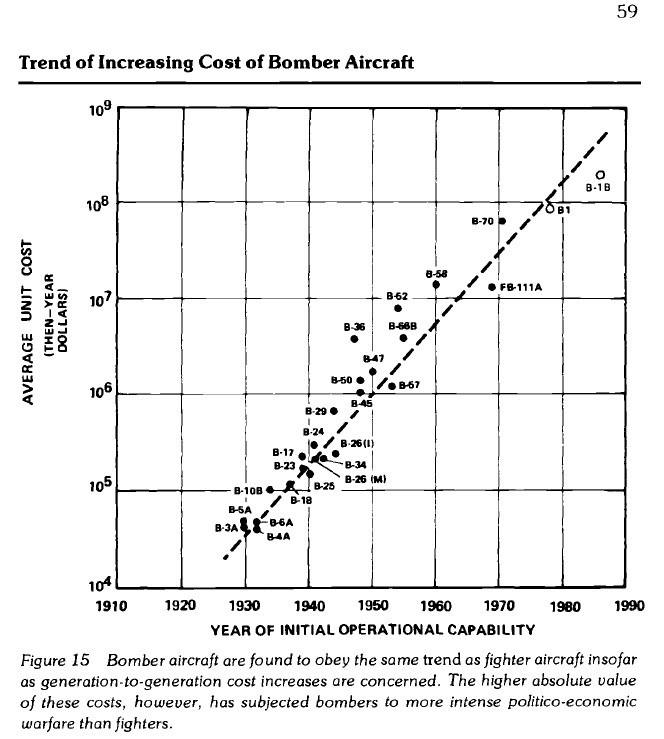 Trend of Increasing Cost of Bomber Aircraft (source: Augustine’s Laws). 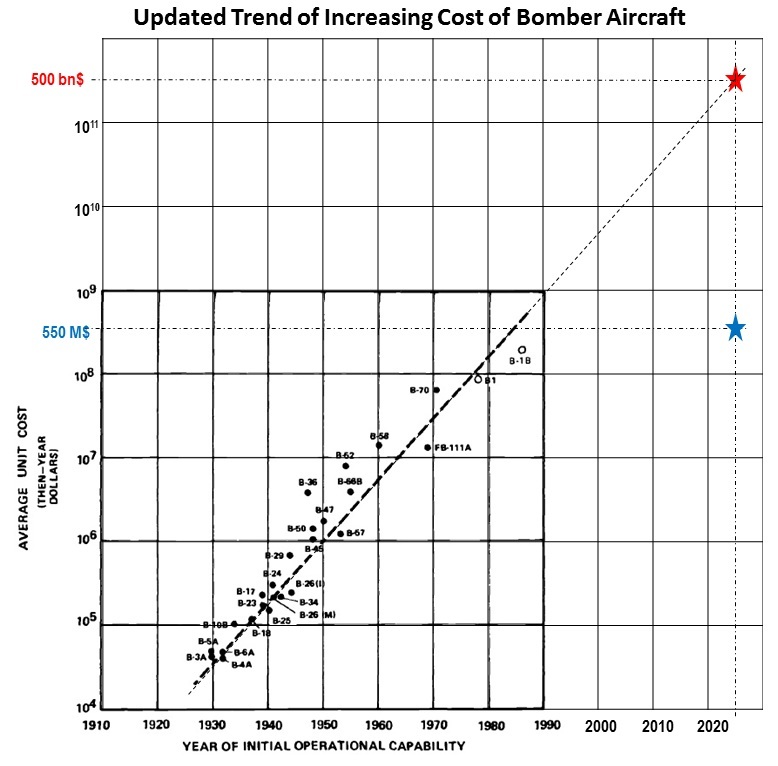 Updated Trend of Increasing Cost of Bomber Aircraft (source: Augustine’s Laws + future long-range bomber information). You will see that I marked 2 different spots in red and blue. The blue one corresponds to the unit cost ceiling of 550M$ reported in the article. You will see that the spot is way off the 70-year old trend (from the end 1920s-1990s). Therefore, I decided to continue the trend line and see at what unit cost would a bomber aircraft with entry into service in the mid 2020s still follow the trend, and I marked that unit cost in red. The result is that the future bomber would have to cost about $500 billion apiece, or a cost roughly equal to the entire Department of Defense yearly budget. That may seem impossible today, completely off reality. How could that happen? Start by imagining that the budget which will be earmarked for 80-100 airplanes along several years, in the end serves to procure many less units (40?, 10?… 1?). Then, add to that the information appearing in the article accompanying the 550M$ figure, “the figure does not include research and development (R&D) costs, which could drive that amount up”. Put all that together and we might end up seeing, 10 years from now, that Augustine’s was right on the spot. Update (2014-03-08): See in the article from Bloomberg, “Long-Range Bomber’s Development Would Get $12 Billion“, a declaration from Lt. General Charles Davis: “Is it going to be $550 million a copy? No, of course it’s not going to be $550 million a copy once you add in everything.“. The article includes further figures providing a new estimate of 810M$ apiece… The closing of the gap between 550M$ and ~ 500bn$ has started.